Mullingar rider Derek McGee on the KMR Kawasaki at the Isle of Man TT in 2018. 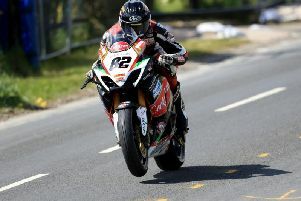 Ryan Farquhar will run a four-man team at the Isle of Man TT on his KMR Kawasaki machines in the Lightweight race. Mullingar’s Derek McGee, who finished as the runner-up behind Michael Dunlop in 2018, is aiming to go one better in June. Lightweight TT runner-up Derek McGee celebrates on the podium with Michael Dunlop last year. The multiple Irish national road racing champion will be joined in the team by Northern Ireland’s Lee Johnston, 2017 race winner Michael Rutter and Lincolnshire’s Gary Johnson. 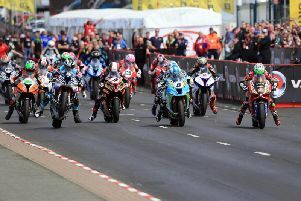 Farquhar said: “The TT remains the biggest test for any team in road racing and the Lightweight class is getting tougher and tougher with a number of new brands and teams coming into it in recent years. Rutter previously rode for Farquhar’s team in 2012 and 2013, finishing third in the inaugural Lightweight TT race for Supertwin machinery. He won the race on a Paton in 2017 and claimed third 12 months ago when he lapped at close to 121mph. Lee Johnston on the KMR/Air Ambulance Kawasaki at the North West 200 in 2017. Fermanagh man Johnston has also previously ridden for the Dungannon-based team in 2015 and 2017, while double Supersport race winner Johnson will be riding a Kawasaki Supertwin for the first time following four years with the Chinese WK Moto team.